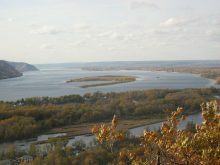 The Volga is the largest river in Europe. Its basin was a place where nations, states and civilisations were born. In the middle of the 16th century, up to 30,000 pieces of beluga and stellate sturgeon were caught annually in its lower reaches and the biggest fish were sent to the royal court. 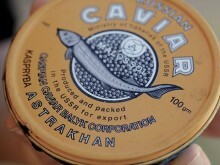 Russian caviar became popular on European markets in the 60s of the 19th century after it was presented at the Paris World Exhibition, adding further to sturgeon popularity and expanding global trade. But world sturgeon catch, which traditionally comes mostly from Russia, reached its peak in 1977 at 32,000 tons and was never matched again. A steep decline began soon afterwards. 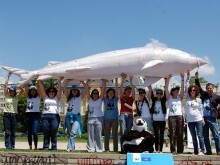 By 2006, the last Russian commercial catch of sturgeons in the Volga-Caspian basin was only about 1 thousand tons. The Volga can barely be called a river today. It is rather a chain of pools with slow-flowing waters that bloom with blue-green algae. 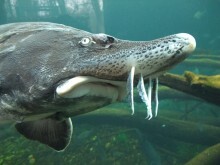 Dam construction, especially in its lower reaches in the 1950s, inflicted a mortal blow to all living things in the river, but most of all – to the most ancient and valuable sturgeon species. The dams blocked the path to the natural places of reproduction of sturgeons and many other fish species. Up to 100% of the spawning grounds of the beluga were lost completely in 1962. 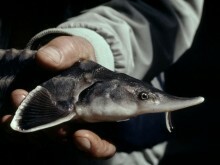 The same happened to up to 80% of the spawning sites of Russian sturgeons and up to 40% of those of stellate sturgeons. Damming also turned the river into a chain of reservoirs. It slowed down water flow and, after years of the sedimentation of mud and other particles, the remaining spawning grounds of sturgeons (the species needs pebbles and rocks) degraded. Some 84.6% of sturgeon spawning grounds completely lost their value. Dams accumulate water in spring and summer in reservoirs and lower water levels in winter, in the period of maximum power consumption. During the spring spawning season, the latest spawning grounds for sturgeon and other fish in the lower reaches of the Volga have remained dry, again due to damming. 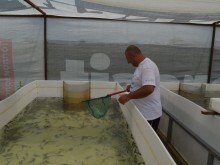 Dams also deplete the nutrients in rivers and dramatically worsen the food base of fish in the North Caspian. Moreover, they reduce the water flow of the river by10 cubic kilometres per year due to the evaporation in reservoirs. The deterioration of the Volga continued in the 80s of the 20th century. 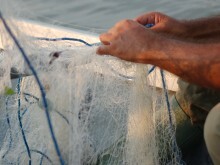 Today, industry and agriculture in the region use about 10% of the total annual flow of the Volga and pollution from sewages, petroleum products, pesticides, defoliants, detergents, and waste from many chemical and industrial enterprises located in the basin are leading to cumulative poly-toxicosis and mutations of the fish. In recent decades, the detrimental impact of dams has led an increasing number of supporters throughout the world to join campaigns to fight large dams. 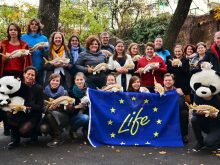 An international forum on combating dams is regularly organised by the International Commission on Large Dams and the International and European River Network. Forum members have spoken in one voice – it is necessary to take all measures to stop the expansion of corporations because the hydropower industry takes into account, first and foremost, its own interests. It is unfortunately not concerned about the harms caused to nature and the possible loss of sturgeons. What must be done to save the Volga? The first step to saving the largest river in Europe must be the urgent implementation of water flow regimes for dams. They must discharge downstream the same amount of water that flows upstream. This would restore the natural hydrological regime in the lower reaches of the Volga to a significant degree. Secondly, the use of pesticides and fertilisers by agriculture must be prohibited in the Volga River basin and other rivers flowing into the Caspian Sea.